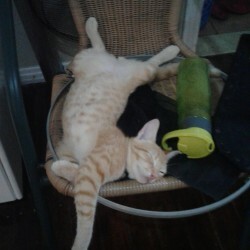 this is what an indoor cat does during a cyclone…He did have to brave the storm near the end and find shelter under the house! What a crazy last few weeks it has been. I feel and see the physical and emotional toll around me, the grieving, processing and slowness of rebuilding life. We are so fortunate in that Winston changed paths at the last minute (we were supposed to be a direct hit, but he moved north to go between Vanua Levu…where we lived first and Viti Levu…where we live now), but it also means that many of friends were far less fortunate. I can’t even really describe how it felt to know that a storm of such incredible capacity was bearing down on us, the unknown of it all, the helplessness, the stories of survival and the stories of death and destruction are a daily topic in the media and in conversation. Our family had a couple from Australia staying with us and we were quite well prepared (pantry stocked, water in containers all around the house, kerosene, lanterns, flashlights, headlamps and batteries ready). We even have the emergency life rafts off Mandolin here are the house….worst case scenario 🙂 We knew the power would be out and were surprised and grateful that we had water the entire time. 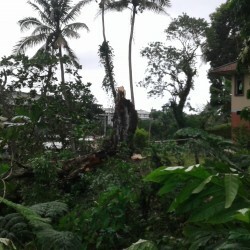 Our power was off for 9 days, which was longer than we expected (our neighbours have lived here over 60 years and have seen a lot of cyclones, but this was the longest the street has ever been without power since they got power!). It was nothing unbearable. It was all part of the adventure. The couple from Australia was here to teach on Biblical Sexuality and so we continued on (which felt a bit weird, but there was not too much else to do…not alot of people in our area needed help and we were all here already!). We gathered together each morning for a teaching session with them and lunch together (Adam and our team cooked…for 20 people every day…so amazing). It was good fellowship and provided a bit of debriefing, as well as time together to pray for this nation and hear stories of how people were doing. 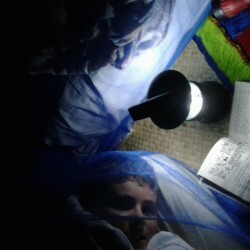 At night we would sit around the lanterns and share stories. It was hot during the days, but felt so much hotter at night with no breeze whatsoever (maybe it was all sucked up into Winston still…) so the boys slept outside, where it was much cooler. 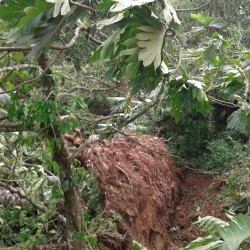 Here are a few photos of some of the destruction around our area. We are so grateful for all the prayers from near and far. Thank you for checking in with us and for standing with us! We now continue to pray and see how we can involved in the next rebuilding process. We have sent aide to several areas already in the form of toiletries, clothes, and money for food (which was bought here in Suva and taken over to Levuka and Savusavu). We will see how and where we can be most helpful in the coming days. 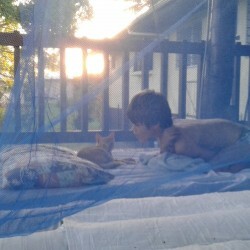 We would set up these beds each night. 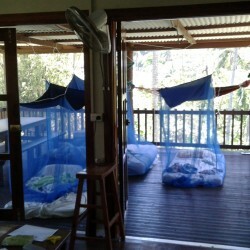 Dengue fever is on the rise again and the next generation of mozzies are active! The roots of the huge Wi apple tree in our back forest…the boys were especially sad about this one as it had the hawks nest in it, but the hawks were okay! It’s hard to see, but the stump in the middle is a huge tree that fell early in the storm…that’s when the storm became quite real! If the tree had fallen the other way our neighbours house would have been gone! 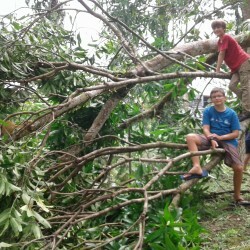 My boys hangin’ out in the downed mango tree in our yard. 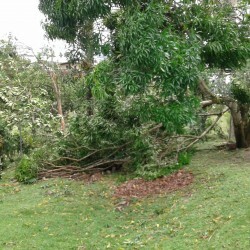 Here is the rest of the mango tree. We sent our kids out with machetes all week and they actually successfully cleared the whole thing and have now built a fort out of the wood! 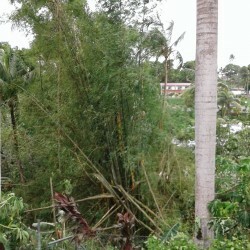 Much of our bamboo in the huge stand behind our house broke and fell, we can now see the highway…we are much more open…and suddenly feel like we live in the city! Hopefully that means more breeze! Our neighbours house. 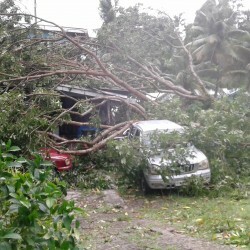 The tree fell on all their vehicles but only damaged the house porch! After the week was over, our guests went to the west and Adam headed to Vanuatu so it was just mom and boys for the deck campout! Waking up to another warm tropical day!